Months after Hurricane Matthew, the levels of desperation and suffering are approaching a humanitarian crisis in Haiti. The storm left over 800,000 hungry, and many regions are still recovering in the aftermath of the storm. Severe food insecurity and the recent end of emergency response programs have impeded many Haitians’ access to basic needs, and major sources of income for some farmers, such as fruit and cacao trees, will be unable to produce this year as a result of the storm. The death toll due to starvation is rising, and many Haitians lack access to safe shelter, clean water and food. Aid workers warn that the situation could deteriorate rapidly, and more will continue to lose their lives if the food shortage is not addressed. Almost six months after deadly Hurricane Matthew destroyed crops and livestock along Haiti’s southern peninsula, life has become so desperate that Haitians are eating poisonous plants and living in caves to survive, aid workers say. 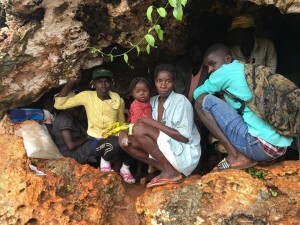 On Wednesday, 240 people, including 84 women and 62 children, were found in a mountain cave near Fonds Rouge Dahere on the outskirts of Jérémie, the capital of Haiti’s Grand’Anse region. They were discovered by an agricultural director with the South-Florida based charity Food For The Poor, and had been living in the cave ever since Matthew’s 145-miles-per-hour winds hit the southern peninsula in October.